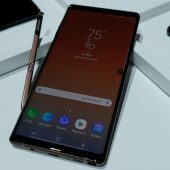 If you believe that bigger is better, and you want to use one of the finest Android flagships available, then you’re going to want to pay attention to the new Samsung Galaxy Note9. 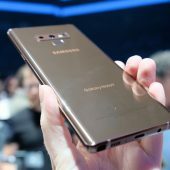 Sporting a 6.4″ Quad HD+ Super AMOLED screen with 2960×1440 (516ppi) resolution, the Note9 will be available in two internal memory versions — 128GB and 512GB. The 128GB version will have 6GB RAM, and the 512GB version will have 8GB RAM. Both will have a 4,000mAh battery (with wireless QuickCharge capability), which is a good thing with such a big screen. Samsung says that battery will last all day, even if you are talking, texting, playing games, and watching movies. 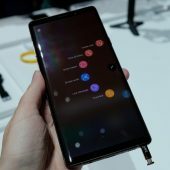 Galaxy Note9 is a super powerful smartphone with cutting-edge 10nm processor [10nm 64-bit Octa-core processor (Max. 2.8 GHz + 1.7 GHz)] and support for the fastest network speeds available in the market (up to 1.2 gigabits per second), so you can stream and download without slowing down. 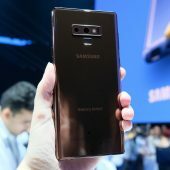 Galaxy Note9 also includes Samsung developed Water Carbon Cooling system and an on-device AI-based performance adjusting algorithm to deliver the powerful yet stable performance. 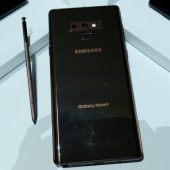 If you are a fan of the S Pen, you’ll appreciate that since it now comes with Bluetooth Low-Energy (BLE) support, you’ll be able to take “selfies or group pictures, present slides, play music and more – with a simple click.” The S Pen charges in less than a minute when inside its Note9 slot, and yes, you can still use it for writing and drawing. 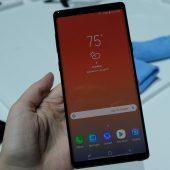 The Galaxy Note9 will also use AI to “see” what you’re taking photos of and automatically classify it as one of 20 categories. It will then optimize settings for the category to give you the best picture possible in gorgeous, vivid colors. Crazily enough, the Note9 will immediately tell you if there is something wrong with the photo you took — like if the picture is blurry, the lens is smudged, the backlighting is an issue or your subject blinked — so you can take another shot. Playing games and consuming media should be a joy, too. 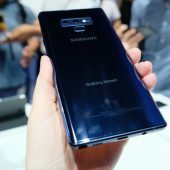 The Note9 will have stereo speakers tuned by AKG, and when using headphones you’ll enjoy Dolby Atmos sound. You can take it to the pool without worry because the Note9 will have IP68 water and dust resistance. If you want something a little bit different, the Samsung Galaxy Note9 will come in two new colors — Ocean Blue and Lavender Purple. You can expect to pay $999.99 for the 128GB version and $1,249.99 for the 512GB version. You’ll be able to order carrier branded and unlocked versions beginning on August 10 at 12:01 a.m. EDT. And of course, as Samsung often does, there are bonuses if you pre-order! If you pre-order the Galaxy Note9 between August 10 and August 23, 2018, you can choose a pair of AKG noise-canceling headphones ($299 value) for free or the Fortnite Galaxy skin with 15,000 V-bucks ($150 value) — or you can get both for just $99 ($449 value). Pick your promotion quickly because the promotion is for a limited time and once their stock is gone, it’s gone. Terms and conditions apply, of course. 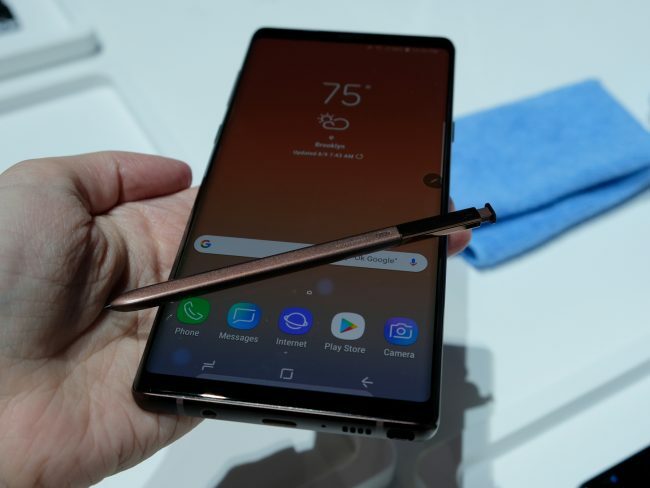 You can learn more about the promotion here, and check out the new Samsung Galaxy Note9 here. 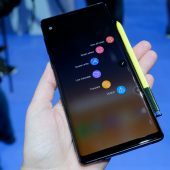 Get the super-powerful new Galaxy Note9 at 50 percent off with Sprint Flex Lease – that’s just $20.83 per month. Galaxy Forever allows upgrades any time to the latest Galaxy after just 12 Sprint Flex payments, exclusively from Sprint. 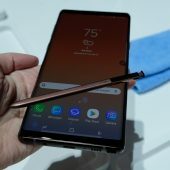 Galaxy Note9 is the ultimate gaming smartphone. Through Aug. 23, take your pick of AKG noise-canceling headphones or the Fortnite Galaxy skin with 15,000 V-bucks for FREE – or choose both for $99. 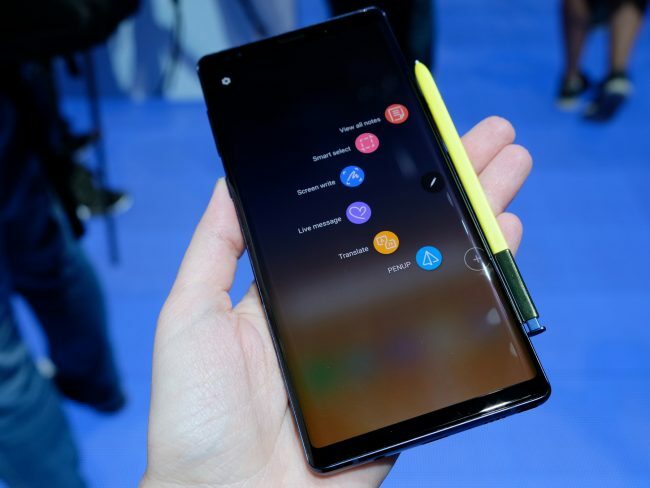 We will be carrying the Samsung Galaxy Note9 in Ocean Blue and Lavender Purple, and anyone who purchases the device on a new line of service will receive $150 back in bill credits. The device will be available to purchase in-store and at uscellular.com on Aug. 24. 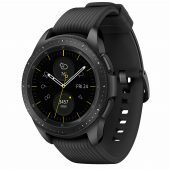 If you were interested in the Samsung Galaxy Frontier, you’ll be glad that you waited for the Samsung Galaxy Watch. The battery has been improved to give you days instead of a day and a half at best, and they all feature LTE connectivity so you can leave your phone at home while you jog and still make calls, get social media notifications, use GPS mapping, stream music, or reply to texts. There are two sizes now, the 42mm in midnight black and rose gold and the 46mm in silver. 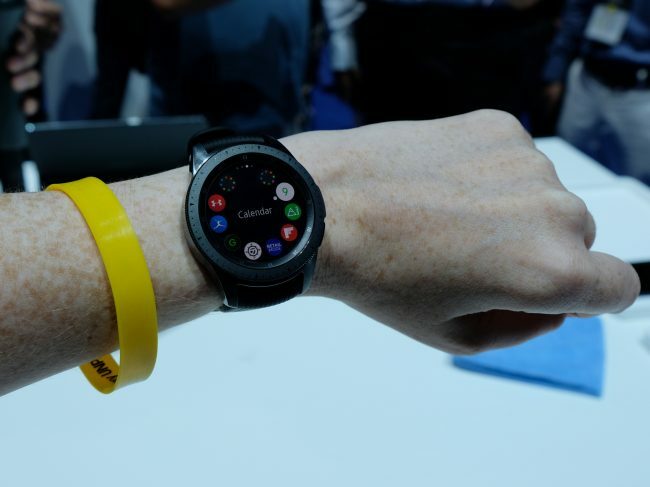 You won’t have to worry about babying the Galaxy Watch’s, either — it’s got military-grade durability, swim-ready water-resistance, and the display has Corning Gorilla Glass DX+ to prevent scratches. If you use a Galaxy Watch with your Galaxy smartphone, you’ll appreciate the way they integrate perfectly together. You’ll have a seamless experience with Samsung Health, Samsung Pay, Bixby, and SmartThings, as well as partner integrations with Under Armour and Spotify. 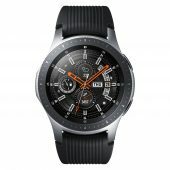 The 42mm Samsung Galaxy Watch Bluetooth version will be available for $329.99, and the 46mm version will be $349.99. 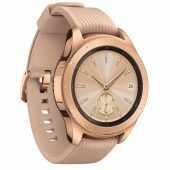 There’s even a special promotion on the watches — if you preorder or order a Galaxy Watch from Samsung before September 8, 2018, you will receive a free Samsung watch band. 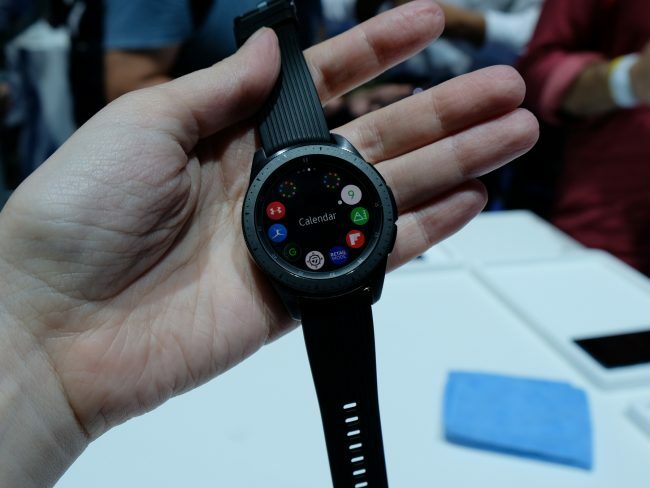 You can learn more about the Samsung Galaxy Watch and put in your pre-order by clicking here. We don’t have much information, but there was also a tease dropped for the new Samsung Galaxy Home. Samsung Galaxy Home will, of course, be using Samsung’s Bixby. I like the design, but I’m starting to feel like all of these smarthome devices are fracturing the market! How many smart speakers do we need in our homes? Which ones work best with the most products already available? Anyway … there’s no pricing, specs, or availability information on it yet; we should have more information late this year.